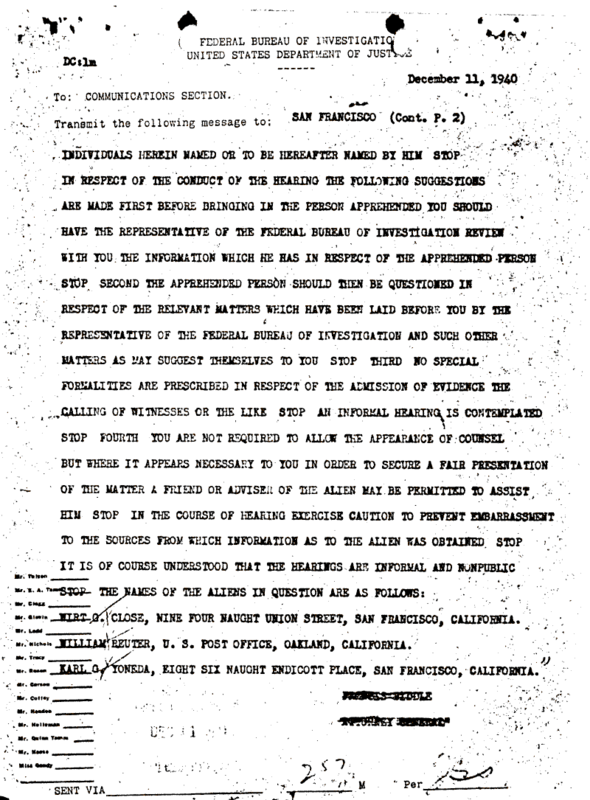 Document Notes: FBI telex transmitting directions from Francis Biddle, Attorney General, to Frank Hennessy, United States Attorney, Northern District of California, San Francisco, detailing procedures to be used in screening alien enemies. This was possibly the first indication of how all apprehended enemy aliens would be screened by civilian hearing boards throughout the country. The process is a good site more refined than redress supporters, who generally deny individual screening, acknowledge. Note: Two of the three individuals involved are not Japanese. FBI communications were used for transmission, probably because they were more reliable and secure.